File photo The annual Rotary pancake breakfast will be held all day Wednesday, April 3 at the Greene County Fairgrounds. XENIA — A Xenia tradition will celebrate 60 years when the Rotary club holds its annual pancake breakfast April 3. For a donation of at least $5, attendees can munch on all the pancakes they want and wash them down with orange juice, mike or coffee. Sausage is included once and two additional can be purchased for $1. All proceeds raised go to the Kevin Sonnycalb Memorial Fireworks Festival and other rotary events, according to Rotary spokesperson Matt Bennett. “We’re about giving back,” he said. Tickets can be obtained from any Rotarian or attendees can just show up at the Assembly Building and make a donation. As in past years, Tudor’s Biscuit World donates the batter while Bob Evans in Xenia provides the sausage at a reduced rate, Bennett said. The fairgrounds helps make the breakfast possible by offering a reduced rate on renting the facility. Anderson-Williams Insurance provides the beverages. Local politicians have been invited to be celebrity “pancake flippers,” around 5 or 6 p.m., according to Bennett. 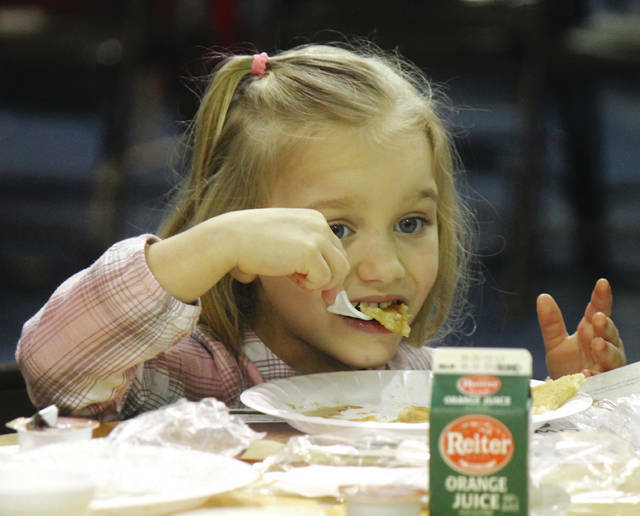 https://www.xeniagazette.com/wp-content/uploads/sites/32/2019/03/web1_SophiaPace.jpgFile photo The annual Rotary pancake breakfast will be held all day Wednesday, April 3 at the Greene County Fairgrounds.